Domicile's newest project that will be located on Main street, has been getting big attention since it first launched in August. The attention is due partly for the history (CLICK HERE to read the full history of the site), partly for the location (very central or "city meets tranquility" - tagline from Domicile), but also how well it has been selling. 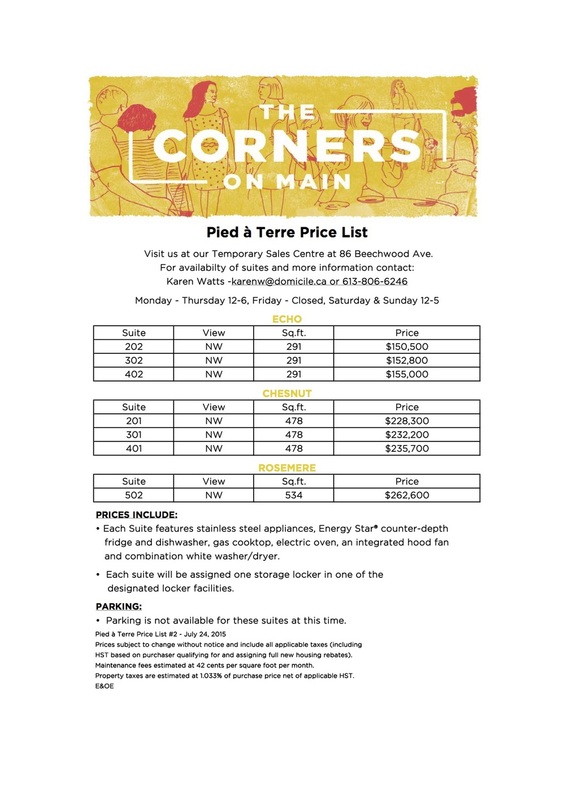 At this point The Corners On Main is almost 50% sold out of the 74 suites for phase one - which is very good comparing to other projects across the city. Buyers still have most floorpans and views available, with prices ranging from $228,300 up to $594,900. Domicile has said they are ahead of schedule for phase one, and has started working on getting phase two ready to roll out. Looking for more information about The Corners On Main or pre-construction condos in Ottawa? Fill out the form below - I would love to chat. Domicile has announced the date for its highly anticipated - The Corners On Main, which will be located on Main Street. Read all about it HERE. For those looking to get first crack at available units, Saturday August 8th at 12noon, at the Kavanaugh Sales Centre located at 86 Beechwood Avenue. Floor plans and more details will be released then. Domicile has released the price sheet (see below) for the available units and one floor plan for "The Centennial" (935sqft, two bedroom, one and a half bathroom, plus terrace). One bedrooms range from $261,600 for the Glenora (554sqft) to $389,200 for the Hazel (850sqft). Two bedrooms range from $411,100 for the Marlowe (930sqft) up to $490,900 for the Brantwood (1105sqft). "Two bedrooms plus" range up to $594,900 for the Merritt (1431sqft with terrace). Parking is an extra $33,500 but not available for the "Pied a Terre" or studio units. Domicile is estimating condo fees at 42 cents per square foot, and $33 per month per parking space. For more information on condos for sale in Ottawa, or assistance with purchasing pre-construction condos - Fill out the form below! Yesterday Domicile posted this on Instagram - appears the brochures ready to go! Domicile Developments posted the above photo on Instagram yesterday which suggests that The Corners On Main is coming very soon. While no official dates have been announced we do know that it will be launched in 2015 and heard a rumour it will be sometime in the fall. Located on Main Street between Oblate and Springhurst, and designed by Roderick Lahey Architect inc. Two six storey buildings, each with 70 residential units, plus roof top terraces, and amenities plus quality that you would expect from Domicile. Expected completion date of Fall/Winter of 2017. Interested in learning more? 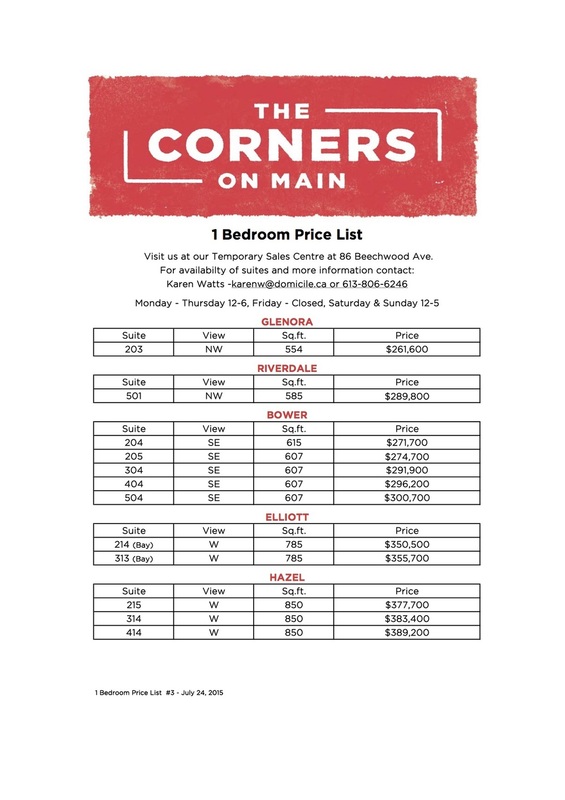 Fill out the form below to contact Matt Richling about The Corners On Main. Domicile has announced that the project located at 141 Main Street will officially be called "The Corners On Main". Announced through Facebook and on Twitter, the local Ottawa builder also linked to the promotional page which includes some history on the location. See the Domicile page here, or check out our write up. The Corners On Main is/was planned to start selling early 2015, with occupancy planned for 2017. Phase one and phase two each plan to include 70 units ranging from 600 to 1250sqft, 140 total units plus commercial space. Domiciles next project to launch will be located in Old Ottawa East, at 141 Main Street. The two building, five floor, 140 unit project, will be located on 3.5 acres between Oblate and Springhurst. The current building, a convent named "Sisters of the Sacred Heart of Jesus" or "Les Soeurs Du Sacre-Coeur De Jesus", dates back to 1902. At the request of the Oblates Fathers, five sisters arrived in Ottawa from Brittany France to provide domestic services. Then in 1911, five townhouses, a boarding school, and a small convent was built. The original convent was destroyed by a fire in 1913 and the present convent was rebuilt a few years after. The Sisters adapted to the Canadian culture and began teaching syllabus to local students. It quickly grew to over 200 students and had numerous additions and wings built. At its peak in 1961, there were 246 Sisters living, and working at the convent. Ceasing to train new members in 1995, the convent presently remains home to 79 Sisters. The property was purchased by Domicile on January 3rd, 2014, who has committed to allow the sisters to stay in the convent indefinitely. For a more detailed read, check out the History of Ottawa East page. Located at 141 Main Street, between Oblate Avenue and Springhurst Avenue, local Ottawa builder Domicile, will be launching the next project called Main Street. Currently a convent, Sisters of the Sacred Heart of Jesus/ Les Soeurs Du Sacre-Coeur De Jesus, dates back to 1902. Still in use today by 79 Sisters who call it home, with many working outside the convent in teaching and nursing positions. Domicile purchased the land on January 3rd, 2014, and is committed to keeping the Sisters in the convent indefinitely. Domicile is looking to construct in two phases, the first being the rear building on Oblate and second phase which will front on Main. Phase one will be a six storey building located at the east end of the property with approximately 70 units ranging from 600 to 1250sqft. Phase two is located at the west end and will contain another 70 condo units. In addition to the residential condos, there will be about 1,485 square meters of retail space for nine or ten smaller shops and restaurants. Domicile is looking to start selling early in 2015, with construction start later the same year and occupancy planned for spring/summer 2017.